Pattern Description: Randomly placed hobs from top to bottom (connectors between sets of hobs).The hobs are elongated when the vase is swung. There are scallops where the pattern meets the base. 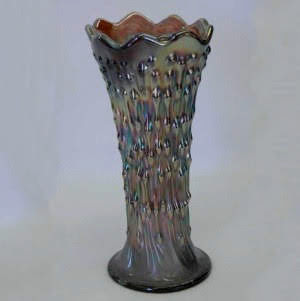 Some vases will have an interior pattern, Peacock Tail. 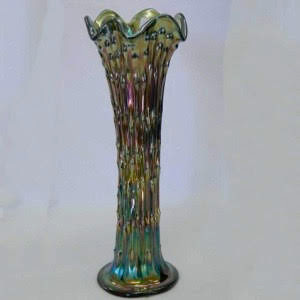 Fenton's April Showers vase pattern is made up of randomly placed, connected, raised hobs. This pattern was pictured in the Butler Bros Wholesale Catalogs beginning in 1910 through 1913, showing up again in 1927 though 1929. 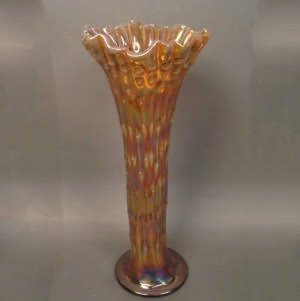 Only reported in a vase, it comes in one base size: 3 3/8″ diameter. The heights range from a squatty 4 1/4″ to a 14″ tall. When they are stretched out so much, the pattern can become difficult to identify. Some of them have an interior pattern (Peacock Tail). The top edge can be 6 flames, 9 flames, or crimped (sometimes called CRE/Candy Ribbon Edge). 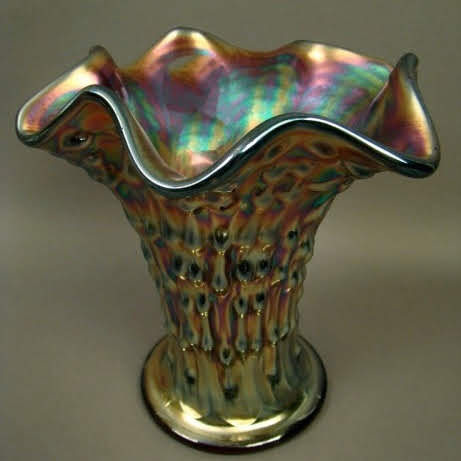 The squatty vases are 7″ or under and usually ruffled.